Until now, installing and maintaining optical networks required technicians to carry a variety of equipment which was not only cumbersome, but also expensive. 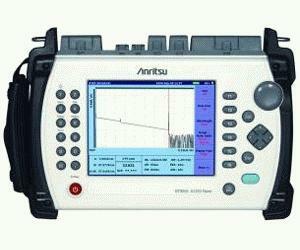 Hearing this common complaint, Anritsu engineers have developed their new line of MT9083A and MT9083B ACCESS Master OTDRs. MT9083A/B test sets are designed to make your measurement experience simple and error-free with true one-button fault location, pass/fail classification, automated file saving and naming and even a macrobend detection feature for identifying installation issues. They feature multiple wavelengths and options to satisfy any network testing requirement: access or metro, FTTx or LAN...all without straining your budget. For FTTx networks, the MT9083 series provides both optical testing at all of the primary wavelengths plus quality of service (QoS) verification via the IP testing option. With the IP option, continuity, download speed, throughput and frame loss of Gigabit Ethernet links can be verified up to full line rate. It also features a unique way to troubleshoot live PON based, FTTx networks without additional costly and complicated external filters. The MT9083B ACCESS Master Series features industry-leading resolution for PON-based FTTx networks and the fastest measurement distance acquisition for mid- to long range fiber spans giving it the best optical performance in the 40dB mini-OTDR class. Many OTDRs claim to be able to test PONs but being able to do it with both high resolution and high range is what sets the MT9083B apart. Splitters up to a single 1x64 or closely spaced, cascaded splitters are completely and accurately measured with industry leading resolution.